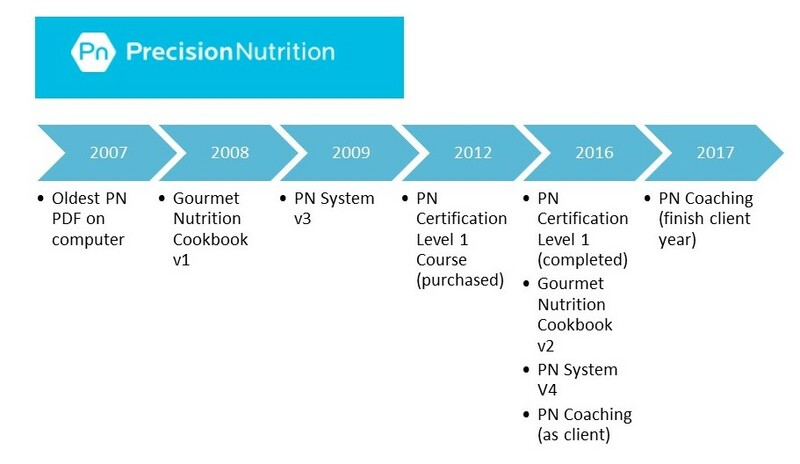 My year of Precision Nutrition (PN) Coaching (coaching FAQ) ends on June 30, 2017. I first started my fitness journey back in 2004, with Body for Life, doing back to back 12 week “competitions.” The program worked well, but I did not have a good transition strategy for maintenance. I got into running, then marathon training, and completely got out of the habit of strength training, for years. Body for Life did however start me on a path of exercising at least 6 days a week, with ever improving daily nutrition. When I started PN last year, I was exercising 6 or 7 days a week, but exclusively cardio (run, walk, elliptical, and hot yoga). My nutrition was already aligned with PN guidelines and my weight was stable. My health and fitness were good, but my body fat percentage was increasing a bit each year (same weight, tighter clothes). I knew what needed to change: less wine, more strength training, and better sleep. I just was not doing it, even though I specifically listed these three things as part of my annual fitness goals for several years in a row. They say insanity is doing the same thing again and again but expecting a different result. I knew something needed to change. I decided I needed a guide, a coach, for my fitness journey to hold me accountable. I still hate admitting that I needed help. I needed help. I signed up for PN Coaching in large part because I’d been following their program, business model and growth as a company for a decade (see timeline). PN was founded by PhD researchers who also used to be fitness competitors. Everything in the program is scientifically validated. No quick fixes. No fads. I had recently completed their certification program where they train people to coach others using their program. Knowledge however is not action. I knew what to do, but I just wasn’t doing it. The year long PN Coaching program opens twice a year – January and July. There is an online platform where lessons (why yes, there is homework), workouts, and habits are posted each day. Every workout has full gym or limited equipment options. And, there are more than a dozen workout plans depending on your specific goals. You can customize how difficult each individual exercise is, complete with video tutorials on how to do each movement correctly. I love this feature. Finally, every 4 weeks, a new workout series is delivered so that the specific exercises and energy systems targeted are changed. In addition to the program on the platform – I had a dedicated coach, a private Facebook group for the women in my cohort, weekly group calls (zoom meetings), biweekly calls with my coach, peer mentors and an assistant coach. A new healthy habit to focus on rolled out every two weeks. I’ll admit that I found the pacing at times to be frustratingly S-L-O-W (especially because I knew what was coming). However, two weeks is about the right amount of time to internalize a new habit and it keeps the changes from being overwhelming. So, in the grand scheme of things, not much happens on the outside during the first few weeks and months – learning habits, doing the workouts, doing the navel gazing lessons, but never really starting a “diet.” With time, one of the “side effects” of PN might be leanness. There are ways to tweak the principles (cost of getting lean), but they are not core to the overall coaching program which is designed to foster a long-term healthy lifestyle. I’m down about 14 pounds and 12 inches. I can finally do real pull-ups and push-ups. I have serious abs for the first time in my life! I had a DEXA done this week, and my abdomen is now 8% body fat. Like many women, I carry my fat in my hips and thighs. 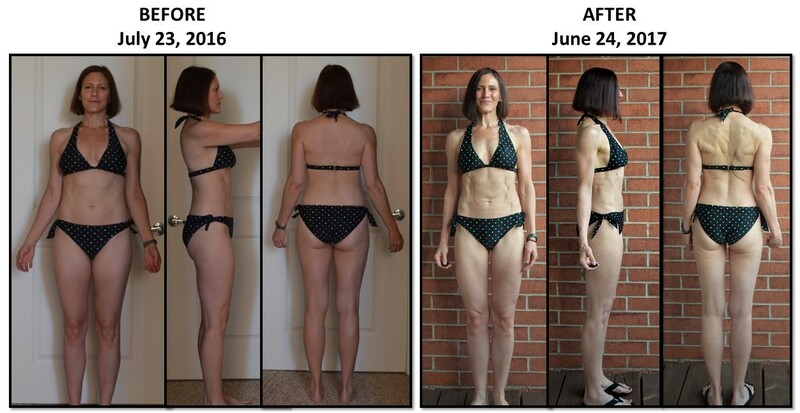 Total body fat is down to 20%, which apparently for a 49-year-old female is amazing. I’m still working to find muscle definition in my legs, so would like to bring this down another percent or two. But overall, I’m happy with my progress, and how sustainable this feels. I will confess that for the last 9 weeks, I adjusted my nutritional macros and food timing to align with a similar, but more goal oriented (food scale required), program called Renaissance Periodization. I discussed this experiment with my PN coach (the amazing coach Jen) before embarking on it. She enthusiastically supported my efforts. She’s a rock star athlete who has challenged her own body in many ways – Ironman, figure competitions, & now competitive power lifting. Like PN, Renaissance Periodization (or RP) has an army of PhD scientists building their nutritional guidelines and programming, more for specific competitive training goals than day to day living (though they did just release new templates with that target audience in mind). My goal was to lock things down and get leaner; and RP is amazingly effective, but somewhat challenging to follow. I may do another few weeks of cutting using RP before relaxing (nutrition) into a 12-week maintenance phase. From there, I’ll either cut some more to lean out my thighs a bit more or try to add some mass to my back and shoulders. But I’m going to do it all from the safety net of another year of PN coaching which will start mid-July. My real goal is to make all of my fitness efforts as effortless as remembering to brush and floss each day. One more year should lock it all down. Body Fat USA: DEXA, VO2 MAX, RMR Testing in Denver, CO. I did all of these tests – the office is clean, professional and private. Highly recommend.